Until today, short uptime is one of the biggest weaknesses or points for improvement of most smartphones available in the market. Year after year, handsets become more affordable while getting faster processors and overall internal hardware and yet, oddly enough, growth in battery technology appears to have hit a stand still. It's baffling, really. 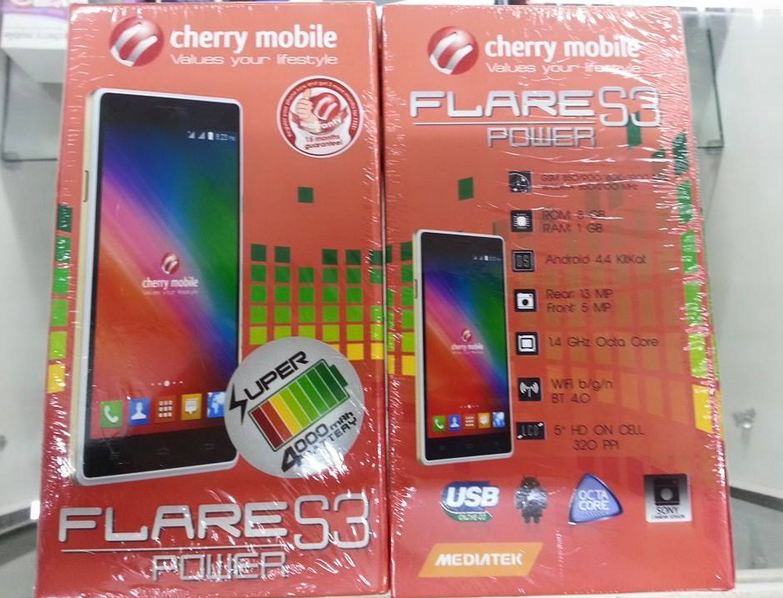 When I first saw promotional materials for the freshly released Cherry Mobile Flare S3 Power, I instantly felt that many consumers who are sick and tired of always having to charge their smartphones in the office or while on the road will fall in love with it. You see, unlike most sub-Php 5,000 Android smartphones out in the Philippines today, this model has a monster 4,000 mAh Li-Ion battery pack -- which is around double that of other devices in its price echelon. This feature doesn't only give this release tremendous uptime but also allows it to function as a - get this - a powerbank (via USB OTG)! 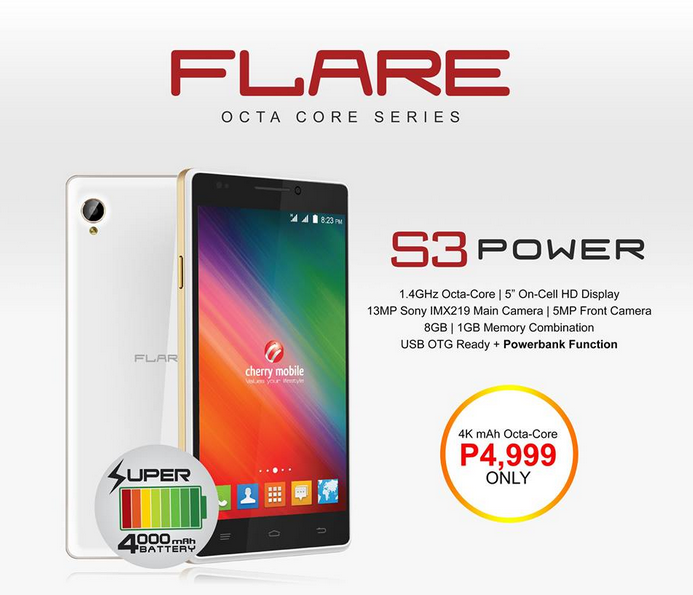 Yup, you can use Cherry Mobile Flare S3 to charge another smartphone on the go. Personally though, I'd rather just use it as a smartphone and enjoy at least 2 days of battery life on 3G. Sweet! This big battery pack is obviously the main selling point of this model -- but there are other things about it that are also quite cool. In terms of looks, it has this heavily cornered shell reminiscent of Sony Xperia ZR, which I find rather attractive. Specs-wise, I'd say S3 Power is better than other similarly priced Android phones currently. It flaunts a 5-inch On-Cell HD display, a 13 MegaPixel autofocus camera at the back with Sony IMX219 sensor, a 5 MegaPixel selfie cam in front, and a Full HD video recorder. Under the hood, it runs vanilla Android 4.4.4 KitKat OS with its Octa Core 1.4 GHz ARM Cortex A7 and Mali 450 GPU based MediaTek MT6592M chipset, handles multitasking with 1GB of RAM, and has 8GB of internal storage that users can beef up through the phone's microSD card slot. You can say that there's a couple of other handsets out there (by competing local brands) with similar innards and a lower SRP but none of those have such a large battery pack. If you ask me, the additional Php 1,000 will be well worth it if you want to bid your 'phone's low battery life problem in the middle of the day' goodbye. Dual SIM Dual Standby and 3G-enabled Cherry Mobile Flare S3 Power is now available at all CM Concept Stores, kiosks, and authorized dealers across the country. Again, it sells for only Php 4,999 and I believe it's out in two colors, Black and White (with Gold Trim).